Spring is just around the corner, the time of year when tornadoes are most common. However, powerful storms such as the ones which recently occurred in Alabama can happen at any time of the year. In fact, some experts say new parts of the country may see an increased threat of tornadoes in their areas. Tornadoes can happen anywhere, at any time of day but are most likely to occur between 3:00 and 9:00 p.m. The United States receives more than 1,200 tornadoes every year. The National Oceanic and Atmospheric Administration (NOAA) reports there were as many as 800 confirmed tornadoes in 2018. 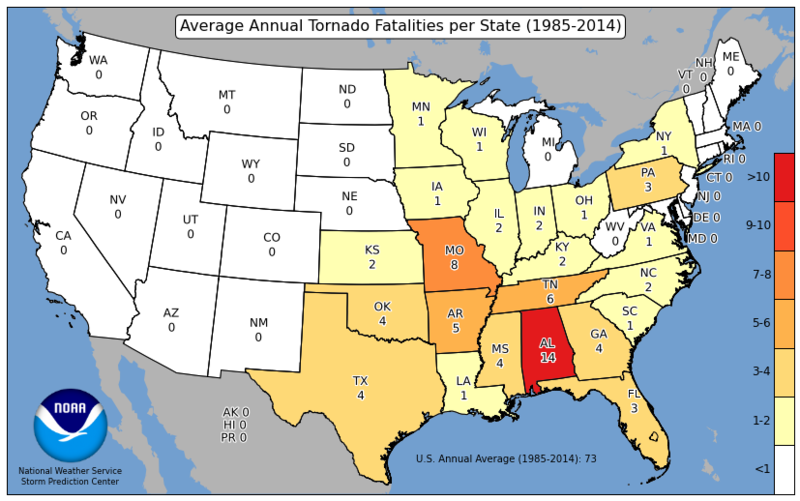 NOAA also reports the four deadliest states for tornadoes are Alabama, Missouri, Tennessee and Arkansas. Most tornadoes occur east of the Rocky Mountains. The area where we see the most tornadoes seems to be moving from the Plains states to the Southeast and Midwest, especially to states along the Mississippi River. · IDENTIFY A SAFE PLACE IN YOUR HOME where you can gather – a basement, storm cellar or interior room on the lowest floor with no windows. In a high rise, pick a hallway in the center of the building as you may not have enough time to get to the lowest floor. SECURE ITEMS OUTSIDE that can be picked up by the wind. KNOW THE WARNINGS. A tornado watch means a tornado is possible. A tornado warning means a tornado has been sighted or indicated by weather radar. IMMEDIATELY GO TO YOUR SAFE PLACE. BRING YOUR ANIMALS INDOORS and maintain direct control of them. o Seek shelter in a basement, storm shelter or sturdy building. o If you can’t walk to shelter, get into a vehicle and try to drive to a safe shelter. o If strong winds and debris are occurring, pull over and put your vehicle in park. Keep your seat belt on and engine running. Protect your head by leaning down below the windows, covering your head with your hands and a blanket or jacket. o Stay away from bridges and highway overpasses. Learn first aid and CPR/AED so that you have the skills to respond in an emergency before help arrives, especially during a disaster when emergency responders may be delayed. A variety of online, in-classroom and blended (part online and part in the classroom) training courses are available at redcross.org/takeaclass.